Martin Scorsese's The Departed barely touched on his story. 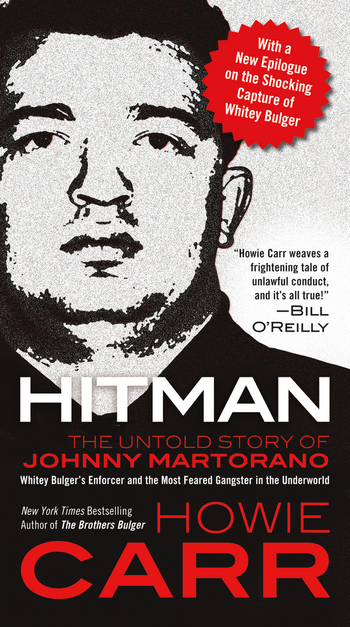 Now radio talk show sensation, crime reporter, and Boston Herald columnist Howie Carr takes us into the heart of the life of gangster Johnny Martorano in Hitman. For two decades Martorano struck fear into anyone even remotely connected to his world. His partnership with Whitey Bulger and the infamous Winter Hill Gang led to twenty mob murders—for which Johnny would serve twelve years in prison. Carr also looks at the politicians and FBI agents who aided Johnny and Whitey, and at the flamboyant city of Boston which Martorano so ruthlessly ruled. A plethora of paradoxes, Johnny Martorano was Mr. Mom by day and man-about-town by night. Surrounded by fast-living politicians, sports celebrities, and show biz entertainers, Johnny was charismatically colorful—as charming as he was frightening. After all, he was, in the end…a hitman. The paperback edition of Howie Carr's riveting true-crime story includes a new epilogue detailing Whitey Bulger's dramatic June 2011 capture. Howie Carr is a columnist for the Boston Herald. He wrote The Brothers Bulger, which spent eleven weeks on the New York Times bestseller list, and the New York Times bestseller Hitman. Carr hosts a daily four-hour radio talk show syndicated throughout New England. In 1985, Carr won a National Magazine Award, and in 2008 he was elected to the National Radio Hall of Fame. Carr lives in suburban Boston with his wife and their three daughters.